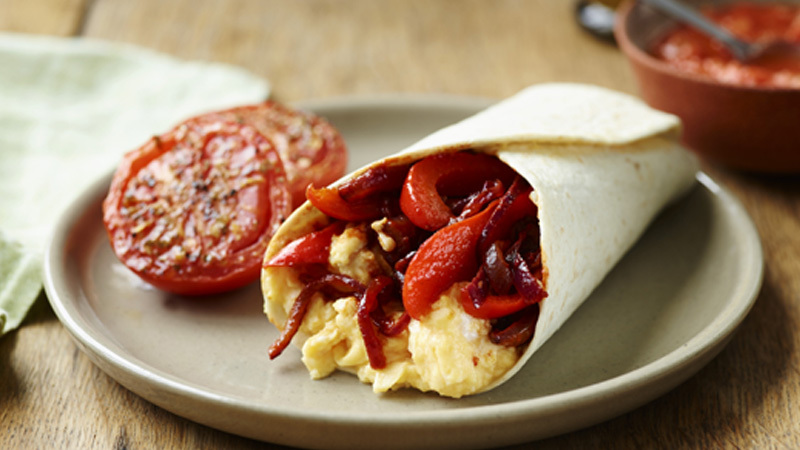 Breakfast is all wrapped up with these simple but very tasty egg and pepper fajitas! Break the eggs into a large jug. Add the milk and beat together with a fork. Season with salt and freshly ground black pepper. Set aside. Melt half the butter in a large non-stick frying pan over a medium heat. Add the pepper and onion and fry for 3-4 minutes until just tender, stir in the fajita seasoning mix for the last minute of cooking. Remove and set aside. Clean the pan with a sheet of kitchen paper. Melt the rest of the butter in the pan and pour in the egg mixture. Cook over a medium heat for 3-4 minutes, stirring occasionally with a spatula until the eggs are lightly scrambled. Warm the tortillas as directed on the packaging. Spoon one-quarter of the scrambled eggs onto the centre of each tortilla. Top with the onion and pepper. Fold both sides of each tortilla over mixture to enclose filling. Serve topped with salsa. If fajita seasoning mix isn't available, just make your own by mixing 1/2 teaspoon chilli powder with 1/4 teaspoon salt and 1/4 teaspoon ground cumin. Serve with rashers of crispy bacon or roasted on-the-vine tomatoes for a really filling start to the day.